How much would changing school start times cost? The bus study is too expensive. Besides, we already have a transportation administrator on staff, so we don't need a third party consultant to do the study. Changing school start times would be too expensive. You are nuts - we shouldn't be having this conversation now. Our local tax burden is a bigger concern than ever before due to the new federal tax bill, and changing the school start times might be an extra expense in a school budget that is already large. My child gets enough sleep under the current schedule. Can’t we just have our teens go to bed earlier instead? Adolescents aren't going to get more sleep. They'll just stay up an hour later if school start times are later. I went to school at 7:30 a.m. and I turned out fine. Besides, don’t teens need to get used to waking up early to prepare for the real world? Have Westport’s community leaders and Board of Education discussed changing school start times before? I’m worried about how changing school start times might affect sports and other extracurricular activities. Does starting middle and high school later mean that elementary schools in Westport will start earlier? Can’t my kids just catch up on sleep on the weekend? What about after school jobs? Why do most of the references on this website link to abstracts instead of full articles? Where does the theme song to Sleep for Success' videos come from? Can I start a Sleep for Success chapter in my town?. Staples High School is already ranked the 5th best in Connecticut according to US News & World Report and our students are already the best, so your data about academic performance isn’t compelling to me. Our athletes are already amazing, so your information about improved athletic performance isn’t compelling to me. If teens are so sleep deprived, then when the clock “falls back” to standard time in November, why don’t adolescents use that “extra” hour for more sleep? Within a few days, my teenager has adjusted his bedtime to the same clock time (which is an hour later than he went to sleep before the switch back to standard time). Won’t adolescents also just stay up for an extra hour if we delay school start times by one hour? Why don’t we implement a sleep health education program instead of moving middle and high school start times to 8:30 a.m. or later? We shouldn't change school start times here because changing the times in Greenwich was problematic. Q: How much would changing school start times cost? A: To determine how much changing school times would cost, the first step is to have our Board of Education hire a third-party bus consultant. This consultant would analyze our district’s bus routes and come up with different start time and bus route options along with the costs of implementing each option. Even if Westport did not end up changing its school start times, this analysis could pay for itself by identifying ways to make our current bus routes more efficient. Greenwich commissioned two bus studies, additional analyses, and staffing for ten to twelve on-site meetings, which cost around $80,000 total. Our study would probably cost less given all of the extra work that the consultants did for Greenwich and because Greenwich is a much larger school district, with over twice as many elementary schools and approximately 8,827 students compared to the 5,750 students in Westport. Click here to see the bus study commissioned by the Greenwich Board of Education. Q: The bus study is too expensive. Besides, we already have a transportation administrator on staff, so we don't need a third party consultant to do the study. A: The bus study is not too expensive. Please remember that our current school start times harm our students' health immensely. This issue is not equivalent to determining whether to add STEM classes or improve our schools in other ways as part of the town's strategic long term planning. Like mold or lead in our classrooms - which our town has historically remediated immediately - our school schedule is a serious public health issue. This is why our country's leading medical organizations have issued policy statements that middle and high school should start no earlier than 8:30 a.m. These organizations do not opine on the content of curricula or how to make our infrastructure more efficient. They warn us about serious risks to our health like smoking, ebola, and lead poisoning. We should take their policy statements seriously and act on them. Commissioning the study also makes sense in the context of Westport’s prior expenditures to improve the safety of our students. For the 2017-2018 school year, Westport spent $65,000 to install seat belts on 13 school busses.57 It will then cost $500,000 to install seat belts on the rest of our school bus fleet.57 We have spent these funds even though, for the time period between 2003 and 2012, only 55 school bus passengers died in crashes.58 As you can see in the table on the right, for the year 2012 alone, over 3,000 adolescents died in motor vehicle accidents and over 2,000 adolescents committed suicide. The $65,000 we have already allocated to reduce a risk responsible for taking 55 lives over an entire decade is probably more expensive than the cost of our bus study. In 2013, in the wake of Sandy Hook, our town paid $98,000 for a security audit of our schools.2 Yet out of all adolescent deaths, only 0.34% consist of homicides on school grounds.3, 4 By comparison, car accidents are the number one killer of our teens, making up 35.0% of teen deaths, while suicide causes 11% of teen deaths.3 Moving school times later has been shown to dramatically decrease motor vehicle accidents and improve mental health. Why would Westport spend $98,000 to identify ways to reduce only 0.34% of teenage deaths and possibly $565,000 to reduce less than .01% of adolescent deaths from school bus accidents, but not spend around $40,000 to figure out the best way for our town to reduce 46% of teenage deaths? Moreover, the bus study should be conducted by an independent third party with expertise in this exact area of school start time changes rather than Westport's transportation coordinator. This is a different kind of analysis than those involved with the more minor schedule changes that we have implemented in past years. Creating an accurate and comprehensive bus study for our purposes here is, in and of itself, a full time job for professionals that have dedicated themselves to this type of analysis and possess specific tools and years of expertise in this area. Put differently, as opposed to handing day-to-day operations with occasional alterations in scheduling, as our transportation administrator does every day, the bus study would be a complex, mulitvariate analysis where the output would be a detailed report that, depending on what constraints we give to the bus consultants, could have 20 or more start time options - with all the related costs accurately accounted for and other non-monetary pros and cons described in detail. To perform this unique logistics task the third party bus consultants have proprietary algorithms, systems, processes, software and techniques that local transportation administrators don't have access to. Moreover, in other school systems that have first tried to have their transportation administrator do this type of analysis, their administrators have been accused of bias when sophisticated parent advocates found inaccurate figures, assumptions, and gaps in the analyses. An independent, third-party consultant eliminates any patina of bias from the process. For all of these reasons, Greenwich hired a third-party bus consultant to do multiple analyses, even though its transportation administrator and CFO are sophisticated professionals as well. Ridgefield has also hired a third-party bus consultant as the first step in figuring out how to implement later start times for the 2018-2019 school year. Hiring a third-party bus consultant should be Westport's first step as well. Q: Changing school start times would be too expensive. A: Before anyone starts arguing about this point, we need to commission a bus study to find out what all the different options would be for implementing later high school and middle school start times and what each option would cost. Perhaps there is a way to make this change that would not affect our school budget. Also, as mentioned in response to the prior question, please remember that our current school start times harm our students' health immensely. This issue is not equivalent to determining whether to add STEM classes or improve our schools in other ways as part of the town's strategic long term planning. Like mold or lead in our classrooms - which our town has historically remediated immediately - our school schedule is a serious public health issue. This is why our town's pediatricians and the country's leading medical organizations have issued policy statements that middle and high school should start no earlier than 8:30 a.m. These organizations do not opine on the content of curricula or how to make our infrastructure more efficient. They warn us about serious risks to our health like smoking, ebola, and lead poisoning. We should take their policy statements seriously and act on them. Despite any budget difficulties, this is a problem we need to fix now for the sake of our children. Such lawsuits might not succeed if they go to trial because the plaintiff would have to prove that the earlier start times caused his or her injuries, but the legal costs of defending against these lawsuits would be significant. By moving start times later we could avoid exposing our town to this potential liability. Q: You are nuts - we shouldn't be having this conversation now. Our local tax burden is a bigger concern than ever due to the new federal tax bill, and changing the school start times might be an extra expense in a school budget that is already large. A: If you understand the science behind the adolescent sleep cycle and have read the policy statements of the AMA, AAP, and CDC on school start times, it is crazier that we haven't fixed this problem in our schools already. Students learn the information they were exposed to during the day when they are sleeping. For every day that we keep our current high school start times spending, all the money that we spend on our schools is not as effective as it otherwise could be. Moreover, and as explained in more detail above, our current middle and high school start times are a serious public health threat. When our town recently found out that there was mold at Coleytown Middle School, our public officials had the mold remediated as soon as possible. This issue is no different. The Westport Board of Finance has encouraged strategic investments in our education system that will yield long-term benefits and productivity. As noted in detail above and on the Benefits page of this website changing middle and high school start times to 8:30 a.m. or later is one of the best investments that our town can make in the productivity of our school system and the health of our adolescents. Q: My child gets enough sleep under the current schedule. Presented by Rafael Pelayo, MD, Clinical Professor, Psychiatry and Behavioral Sciences, Stanford Center for Sleep Sciences and Medicine. A: Are you sure? As the American Academy of Pediatrics has pointed out, there is a “significant lack of awareness among adults regarding the extent of adolescent sleep loss.” 5 A nationwide poll showed that only 9% of high school students are getting the sleep that they need each night, while 71% of the parents surveyed believed that their adolescent did in fact get enough sleep.5, 12, 13, 14, 15As Dr. Pelayo explains in more detail in the video below a teen that, when left to his or her own devices, sleeps two or more hours on the weekends past the time that he or she wakes up on school days, this teen is sleep deprived. Q: Can’t we just have our teens go to bed earlier instead? Q: Adolescents aren't going to get more sleep. They'll just stay up an hour later if school starts an hour later. Q: I went to high school at 7:30 a.m. or even earlier, and I turned out fine. Besides, don’t teens need to get used to waking up early to prepare for the real world? Now that we know better and leading health organizations have recommended that school start no earlier than 8:30 a.m., it makes no sense to leave start times as they are. When the American Academy of Pediatrics recommends that we have babies sleep on their backs without crib bumpers, should we ignore them because our parents did otherwise and we turned out fine? When the American Medical Association recommends that we not expose our children to cigarette smoke, should we ignore them because we were exposed as kids and we turned out fine? When the CDC tells us we shouldn't have more than a specific amount of lead in our schools, should we leave a school covered in chipping lead paint the way it is because some of our schools were the same way when we were students? As one school superintendent explained, "the science and the evidence is so clear, that if I did nothing at all and just continued on with the same start times, I was hurting kids. "66 Now that we know better, we need to do better in Westport too. Put differently, imagine that you spent a long time in Iceland during your youth, but since then researchers have discovered that there is something in the environment that, for teens, causes lower academic and sports performance, reduced creativity, poor mental health, an increased likelihood of car accidents, and a greater likelihood of sports injuries. So the CDC recommends that teens not travel there. Would you send your adolescent children there anyways because you grew up in that environment and turned out fine? And not changing school start times because teens will have to wake up early in the “real world” is equally ridiculous. Biology causes adolescents’ sleep cycle to shift later, just like biology causes toddlers to need 1 or 2 naps each day. Making teenagers attend school so early to "prepare" for the real world is like asking toddlers to skip their naps to prepare for second grade. By the time teens are in their early twenties and in the “real world,” their sleep cycle will have shifted back.6 The "real world" is also a diverse place, with schedules varying greatly from person to person. We shouldn’t compromise adolescents’ health and potential by making them wake up so early now just because they might have to, or choose to, wake up early years later. Q: Have Westport’s community leaders and Board of Education discussed changing school start times before? A: Yes. In 2003, the Westport Board of Education formed a special school start time committee that included principals of 4 schools, 3 teachers, the athletic director, a nursing supervisor, and a PPS coordinator. The committee commissioned Clive R. Belfield of Columbia University to examine the research on school start times and write a report. In his report, professor Belfield wrote that “the link between lack of sleep and impaired general cognitive capacities is strong and compelling” and that “it is possible to infer” that Westport's current school start times impair educational performance. He ultimately concluded, however, that there needed to be more research on the effect of start times on academic performance. He also noted that scientists hadn’t yet determined what school start time would be most beneficial for adolescents. After meeting 13 times and reviewing Professor Belfield’s report, the special committee wrote a final report in March 2004. In the report, the committee concluded that “the scientific literature does not provide enough evidence to support altering school start time for high school students at the present time” because: (1) the committee wanted more evidence that students would get more sleep with later start times, (2) the committee was waiting for more guidance from experts on what start time would be best. In fact, some scientists suggest that, while changing start times to 8:30 a.m. is a move in the right direction, start times of 10:00 a.m. or 11:00 a.m. would be ideal for high school students and freshmen in college. 13, 14, 17 Changing our middle and high school start times to 8:30 a.m. is the very least that we should do for Westport's adolescents. Since 2004, scientists have also learned more about the importance of sleep and how later school start times improve academic performance, sports performance, mental health, and numerous other important facets of teenage life. School start times have been brought up on other occasions during the past 13 years, but the Board of Education has not looked at the issue in depth again. Q: I’m worried about how changing school start times might affect sports and other extracurricular activities. 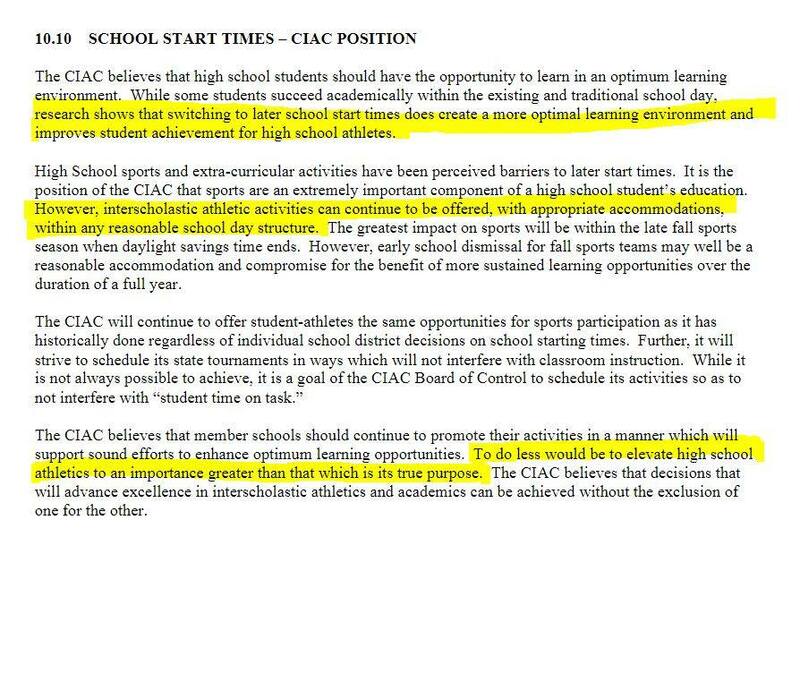 Other schools in the CIAC are also working towards implementing later start times. Ridgefield has committed to institute later start times for the 2018 - 2019 school year, and Greenwich High School will start classes at 8:30 a.m. starting in September 2017. Reportedly, Greenwich athletic director Gus Lindine was originally apprehensive about the change, but he is now excited that the district’s new sports schedule will take advantage of the many scientifically demonstrated benefits of more sleep for student-athletes, including enhanced performance and significantly reduced injuries. If Westport does not follow suit and move school start times later as well, our adolescents will be at a significant disadvantage to their better-rested peers in Wilton, Greenwich, and Ridgefield, not only in the classroom but also on the playing field, in the orchestra, and in the artists’ studio. Q: Does starting middle and high school later mean that elementary schools in Westport will start earlier? I don’t want my young children waiting for the bus in the dark. A: There will be many different scheduling options for implementing healthier school start times, and the first step to figuring out what these options are is to commission a third-party bus study. This study will come up with a long list of all the different start time options, the estimated costs of implementing each new schedule, if any, and any other pros and cons of each option. Ideally, none of our children should be waiting for a bus in the dark, regardless of their age. Age does not make pedestrians more visible to drivers. Nor does age make adolescents invisible to predators lurking in shadows of the dawn. Our school start times should keep ALL children safe, not just the youngest ones. Q: Can’t my kids just catch up on sleep on the weekend? Q: What about after school jobs? A: Our current school start times are a serious public health hazard for our adolescents, as the AAP, AMA, and CDC have explained in their position statements. After school employment should not take priority over fixing something that is so detrimental to our teens' health and futures. We also need to remember that changing school start times has such a large impact on academics alone that our students can expect their future earnings to increase by 8%6 And most high school students work lower wage jobs. If students did have to work less hours now due to later start times, the end result would be a cost-effective investment in their future. Q: Why do most of the references on this website link to abstracts instead of full articles? A: While most of the articles and news sources referenced on this website are publicly available through other websites, if we link to those websites directly and the website at issue has posted that particular article in violation of copyright law, we could be sued. Q: Where does the theme song to Sleep for Success' videos come from? A: The song is called "City of Love" and it was written and performed by Jake Bernard, an amazing young musician and graduate of Staples High School. You can read more about Jake on Dan Woog's Westport blog, 06880, and hear more of his music on YouTube, Facebook, and Spotify. Q: Can I start a Sleep for Success chapter in my town? A: Great idea! Contact us for more information. Q: Our high school is already ranked the 5th best in Connecticut according to US News & World Reports and our students are already the best, so your data about academic performance isn’t compelling to me. A: Without a doubt, our schools are amazing. But there is ample room for improvement. The US News & World Report rankings are arguably problematic, but if we are going to use them as a benchmark, Westport also placed 391th in the national high school rankings. We called the high schools ranked in the top ten. The morning start times for first period at these schools, put in order of the best high school to the tenth best high school, are 8:25, 8:25, 8:40, 9:15, 8:15, 8:40, 8:25, 8:25, 9:15, and 8:15, respectively. Staples High School starts at 7:30 a.m. Even the valedictorian of Staples High School is a human. And as a matter of neuroscience, our school district has prevented this student from even coming close to reaching his or her full potential due to our current high school schedule. Now some of you might still think, “Who cares? Being valedictorian is good enough.” It’s not when that student could have learned more and done even better. Staples High School, Fairfield County, and even the state of Connecticut is still, metaphorically speaking, a very small pond in our global community. Other students around the country and around the world are benefitting from later start times, and the number of students in this group is growing every year. For example, schools in the U.K and Finland typically start at 9:00 a.m. at the earliest.32b, 32c, 32d These are the peers that our students are competing with for college admissions and later, for jobs, among many other things. In short, yes, Westport’s schools are amazing and a great source of pride for our town. But our children also deserve better than a school district that prioritizes aspirational goals without first providing students with the basic, biological necessities they need to fully achieve these goals – which, for us, is later middle and high school start times. Q: Our athletes are already amazing, so your information about improved athletic performance isn’t compelling to me. Q: If teens are so sleep deprived, then when the clock “falls back” to standard time in November, why don’t adolescents use that “extra” hour for more sleep? Within a few days, my teenager has adjusted his bedtime to the same clock time (which is an hour later than he went to sleep before the switch back to standard time). Won’t adolescents also just stay up for an extra hour if we delay school start times by one hour? A: There is no scientific consensus regarding what happens to the adolescent sleep cycle when clocks “fall back” to standard time. In fact, the premise of the question – that in general teens quickly fill the “extra” hour with wakeful pursuits rather than getting more sleep – might not be true. Regardless of what the scientific community eventually concludes regarding the effects of DST on teens, however, there is no reason to think that adolescents will stay up for an extra hour if we moved our school start times one hour later. In contrast to the paucity of research regarding teens and DST, so many studies in different settings by different experts have found that adolescents get more sleep with later school start times that there is “virtually unanimous agreement” among researchers on this point.4 In fact, as detailed throughout this website, “the findings are unequivocal”5 and “few, if any educational interventions are so strongly supported by research evidence from so many different disciplines and experts in the field.”6 That’s why the position statements of our nation’s leading medical and educational organizations and all of our local pediatricians don’t just note that adolescents need more sleep; they state that middle and high schools should start no earlier than 8:30 a.m. So, how might moving start times later by an hour result in better-rested teens even if, hypothetically, the same doesn’t occur when the clock “falls back” to standard time? The information below is reasonable conjecture rather than scientific fact, but there are at least three reasons why the two scenarios might yield different results. First, during the “fall back” from DST, every scheduled aspect of a teen’s life automatically shifts one hour later. These externally dictated schedules concretely affect the timing for bedtime, while no such constraints exist in the morning to wake up with the exception of school start time. And while some extracurricular activities might meet later in the day if school start times were later, post-school activities and responsibilities of teens might be accomplished in a more efficient manner, leaving more time for sleep. For example, students with later school start times complete homework more efficiently7 because they are more alert, manage their time more effectively, and have improved attention, memory, abstract thinking, and verbal creativity.8 Sports coaches could get better results from their athletes with shorter practices because their athletes build and repair muscle more quickly, improve skills and learn team plays more easily, have faster reaction times, and are significantly less likely to get injured 9, 10, 11 – collegiate and professional athletes have found this to be the case and as a result many teams now hire sleep consultants and track athletes’ sleep. 12, 13, 14, 15 Likewise, our musicians could learn the fine muscle movements needed to play their sonatas more quickly and our theatre stars could master their lines and blocking in less time.16 Adolescents with later school start times even spend less time watching television.17,18 In sum, and as opposed to adjusting a clock while keeping the exact same daily schedule, moving school start times an hour forward is just that – a change to middle and high school hours. The other things that students seek to accomplish after school – including homework – might not take as long. Second, residents of districts that have moved school start times later learned about the importance of sleep during that process and have a much better understanding of sleep science than the general population. Many people still view adequate sleep as something for the boring, weak, or the lazy. When there’s only 24 hours in the day and you have ambitions – academic, athletic, career, musical, social, or all of the above – sleep is usually the first thing to go. But when parents and students understand that sleep deprivation literally and figuratively prevents adolescents from fully achieving any dreams they might have, sleep becomes more of a priority. In fact, to help ensure that sleep is prioritized, some districts also add sleep health education programs to their curriculum when they change to the recommended start times of 8:30 a.m. or later. For example, around the time when Menlo-Atherton High School changed its first bell from 7:45 a.m. to 8:45 a.m., with classes starting twice a week at 9:30 a.m., it also implemented an award-winning sleep education program in partnership with Stanford University.19 The average teen adjusting back to standard time in the fall does not have the same knowledge base. Third, as mentioned previously, the only study using objective measures regarding adolescents and DST concluded that teens did not fully adjust to the “spring forward” to DST.20 And research on adults shows that, based on sunrise and sunset times the “fall back” to standard time may take place a month too late.21 In other words, it is possible that teens’ never fully adjust their bedtimes to DST and their circadian systems are primed to adjust back to standard-time bedtimes in November. This is a completely different scenario than moving school start times later. As any parent of an adolescent has observed, once their teen is asleep, if given the option he or she will usually occupy free time in the morning with more sleep. In sum, what teens do or don’t do when clocks are adjusted as part of DST shouldn’t dissuade us from changing our middle and high school start times to 8:30 a.m. or later. The scenarios are different in many important ways, and there is a wealth of evidence – evidence that has been vetted and endorsed by our country’s leading medical organizations – proving that adolescents get more sleep with later school start times. Q: Why don’t we implement a sleep health education program instead of moving middle and high school start times to 8:30 a.m. or later? If you think about it, adding sleep education alone under our current circumstances would be cruel. Our schools would be teaching students about the serious harm caused by sleep deprivation, while keeping a schedule where it isn’t possible for them to get enough sleep. The scenario would be analogous to teaching students about the dangers of mold exposure in a school where there’s mold. If we want to improve the health and safety of our students and help students reach their full potential through a sleep education program, we should also implement school start times of 8:30 a.m. or later. Otherwise, we are giving students the knowledge they can use to improve their lives in the future without giving them a chance to fully implement this knowledge now – which might be too late for the teen who could have performed well enough to get into their preferred college with more sleep, the teen whose frontal lobe will never be able to assess risk accurately due to adolescent sleep deprivation or, in the worst case scenario, the teen that became addicted to substances, died in a car accident, or the teen that committed suicide. Q: We shouldn't change school start times here because changing the times in Greenwich was problematic. A: There was a good op-ed published in the Greenwich times regarding this issue, which you can see here. We’ve made some additional points and provided details below. First - and in spite of the initial logistical difficulties which are addressed in more detail below – there’s no real evidence that the new schedule in Greenwich is unsuccessful. As the author of the op-ed explained, “[a]ll leading medical authorities and experts in the United States have spoken in one voice recommending an 8:30 start a.m. time or later” based on extensive evidence from multiple fields. Some parents have claimed that the 8:30 a.m. start time is worse than the old 7:30 a.m. start time, but this is anecdotal evidence. And there is just as much, if not more, anecdotal evidence from other parents indicating the opposite. For example, one mom of two high-achieving GHS students recently reported that (a) her kids get their homework done earlier because they are more alert and efficient (b) they go to bed at the same time or earlier, and (c) they have not had a single sick day. Another parent was thrilled that her son, an all-state musician, is sleeping more, learning new pieces faster, and performing better than ever. These outcomes make sense because students with later school start times get more sleep, and students that get more and better sleep perform better in academics and athletics. Second, Greenwich experienced some unique logistical difficulties that probably would not occur at all or to the same extent in Westport. General: It is possible that the implementation team in Greenwich could have prevented some problems from occurring through better planning in the 14 months prior to the start of the 2017 – 2018 school year. The Greenwich School District had new administrators in key positions, including the Superintendent, Chief Operating Officer, and head of transportation. The start time project manager also left the school district and was never replaced. It is unlikely that our seasoned administrators and implementation committee would make the same mistakes, especially with the benefit of knowing the hiccups that occurred in other towns like Greenwich. Traffic Congestion: School start times aside, Greenwich High School has a difficult location for purposes of traffic, regardless of what time school starts and ends. The school is near I-95 and right off what is effectively Post Road in Greenwich. The town is also in a tough spot for purposes of traveling to games and competitions after school. Greenwich is on the western border of the FCIAC Conference, which means that travel to away games is always in the direction of rush hour traffic. Westport is more centrally located, and we can ask our independent school bus consultants to come up with start-time scenarios that are traffic neutral or possibly even improve traffic flow. Field Lighting: The football team ended up having some post-regular-season practices with little daylight. With respect to field lighting, Greenwich High School is in a uniquely difficult situation due to more burdensome zoning regulations and a litigious neighbor. All officials were aware of these issues over a year before the 2017-2018 school year, but the school board didn’t approach the P&Z to install temporary field lights until October 2017 (this application hasn’t been decided and football season is over). And the district only recently decided to pursue litigation to relax the restrictions on the high school field lighting. The district could have started these efforts a year earlier or explored other solutions such as using nearby fields and lighting at Central Middle School, installing a temporary bubble over the GHS fields, or reducing the football’s team practice time from 3 hours to 2.5 hours. Sports are an important component of student life, and later school start times would improve our athlete’s performance dramatically. Our excellent school administrators work together and with local youth athletic organizations to iron out implementation logistics related to athletics. Missed Classes for Athletes: As mentioned previously, Greenwich is on the western border of the FCIAC. The town’s sports teams already have to travel greater distances than Westport student athletes because Westport is more centrally located. And Greenwich makes every one of these trips in the direction of rush hour traffic. Our student athletes would not have to leave as early to get to away games. For the students that do have to leave early, however, why not use the new start times as impetus for having any class recorded that must be missed for athletes to attend away games. These classes would be known well in advance, so it wouldn’t be burdensome to plan, and the technology involved to do so is relatively inexpensive. If we could do this, our athletes might end up “missing” less class than they did before the start times changed.